No one know it was her! It's possible that no one had a better time at this year's Comic Con than Lupita Nyong'o. The star of Marvel's upcoming 'Black Panther' movie as well as 'Star Wars: The Last Jedi' arrived at Comic Con incognito, and it looks like she had an absolute blast. The star began tweeting out videos of her Comic Con adventures on Wednesday, giving those that might have had a chance encounter with the Academy Award winner. Nyong'o also attended out of costume to appear on the panel for 'Black Panther', where fans were shown new posters and a new teaser. 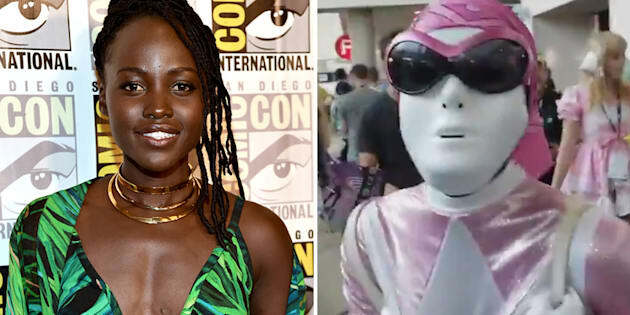 After she revealed she had been mingling with the crowds all along, some Comic Con attendees were shocked to realise they hadn't just seen Nyong'o, but they had interacted with her, thinking of her as just a real enthusiastic 'Power Rangers' fan. OMG!! You came by my table!!! I talked to you and now i want to die! Even the official 'Power Rangers' Twitter account weighed in on her outfit. Oh Lupita, we don't deserve your greatness.